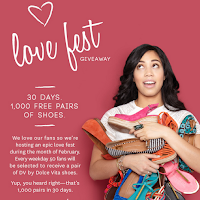 Enter to Win 1 of 1000 Pairs of Dolce Vita Shoes, 50 Winners a Day! If you "like" Dolce Vita on Facebook, you can enter to win 1 of 1,000 pairs of shoes! 50 winners will randomly be picked everyday for the next 30 days!